For those with the necessary wherewithal, luxury travel in the UK can be a marvelous thing. Whether it’s staying in a beautiful manor house or castle, surrounded by impeccable manicured gardens or in a luxurious hotel or resort, there is plenty on offer. In fact you can choose from the best of luxurious accommodations in the UK with luxury travel companies like LTR and really stay in style. If looking for something really unusual in the way of luxury, there is a great new possibility on the horizon. According to the Daily Mail, a set of seven huge metal Maunsell gun towers known as the Red Sands Fort, constructed in 1943 during WWII off the Kent coast, might just be the thing of the future. Pictured below, they will obviously need a bit of work. 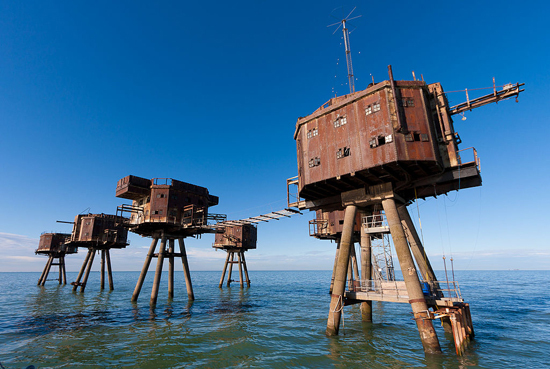 The wartime sea forts were constructed in the middle of the Thames estuary in 1943 to protect the UK from attacks from Nazi aircraft and doodlebugs, as well as to give the opportunity to attack German ships laying mines in the area.. While they have been standing abandoned for so many years, these unusual constructions off the coast of Whitstable in Kent could soon be converted into a luxury resort, with a range of restaurants and bars, a spa and leisure centre and luxurious executive apartments offering the very best with every comfort possible.. Described as a possible billionaire’s playground, they reckon the newly converted gun towers could even rival Richard Branson’s well-known Necker Island and are predicted to knock you back thousands of pounds per night for the experience. Reportedly the new resort would only be accessible by catamaran or helicopter and would offer a luxury escape to anyone with the available cash. Dubbed Operation Red Sands Project, the brainchild of the idea comes from the company Next Big Thing Creative, who were responsible for London’s Battersea Power Station redevelopment. In an interview David Cooper, who is in charge of the project, said that it was hard to put a figure on what it would cost to convert the towers, but that the results would be well worth it. 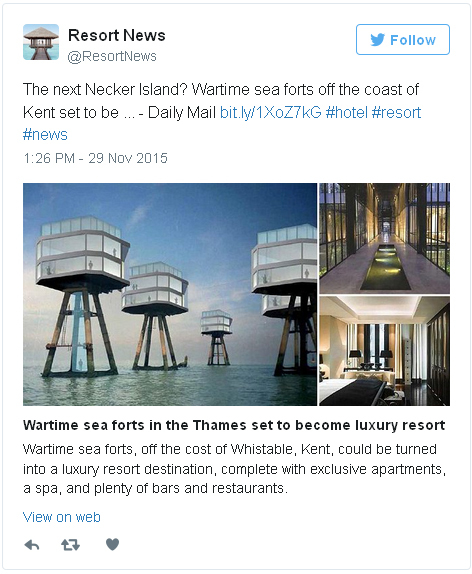 According to Cooper, the completed resort, offering the best in luxury accommodation in the UK, would then be marketed to billionaires, who would then be whisked over to the resort from the city of London. The gun towers were apparently decommissioned back in the 1950s and are not technically owned by anyone, but are on land that belongs to the Crown Estate. Reportedly the Crown Estates lease the ownership of the property to the Red Sands Project charity for 99 years, who would, in turn, lease ownership to a hotel developer. The whole project sounds really exciting and could be the next best thing in luxurious accommodation in the UK in a few years' time. Enjoy a brief aerial tour of the Red Sands Fort as it is today in the video below.